Put the power of advanced technology at your fingertips with the deluxe Superprint 4425. This feature-packed TTY includes sophisticated capabilities, giving you more choices than ever It features direct connect with two built-in telephone jacks and advanced calling features like auto-busy redial, three way calling, and TTY transfer. Call progress tells you if the phone you are calling is ringing or busy. Auto-Answer takes messages for you when you are unavailable. The 32k memory lets you save hundreds of telephone numbers, memos, and Auto-Answer messages by name. You can personalize greeting messages, memos, and outgoing Auto-Answer memos. Convenient arrow keys make it easy to review information saved in memory. Turbo Code lets you control the speed of your conversations and enjoy real-time communication with other Turbo Code TTYs. It also lets you interrupt one another. The TTY Announcer lets hearing people know you are on the line. The User-programmable Relay Voice Announcer tells hearing callers to use a TTY or use relay, and gives the phone number for your relay service. Auto ID lets everyone you call know that you are using a TTY. 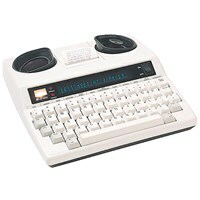 The Superprint 4425 has: Direct connect (with 2 jacks) to standard telephone line, User-programmable Relay Voice Announcer, Call progress - display indicates ringing or busy, Auto-Answer capabilities (with programmable message), Auto-busy redial, Wait for Response and 3-way calling, Remote message retrieval, Tone or pulse dial, Keyboard dialing, follow-on dialing, call transfer, Memory dialing/redial. The Superprint 4425 also features: Built-in, 24-character printer, 3 selectable print sizes, 32k memory, Date/time printed at the beginning of each call, rbo Code and Auto ID, E-Turbo for simplified relay calling, Built-in ring flasher, Arrow keys for easy review of memory, Convenient GA/SK keys, Easy-touch greeting memo, TTY AnnouncerTM tells hearing callers you are using a TTY, Baudot code (45.5/50 baud rate), Sticky key feature (for single-handed typing). Covered under a 1-year mfg. warranty.